Posted in Guaymas, Indoor Activities, What to Do? What’s Playing at Cinemex Guaymas ? Cinemex Guaymas has 8 salons often with a dozen different “just released” movies playing. OK, you want to go to the movies and you know how to get to the Cinemex web page, now what? This site can be daunting with it only being listed in Spanish (oh, my Spanish teacher will be so proud of me, thanks Dolores!). Here is a brief tutorial on easily navigating this site so you can go see that particular movie. If you haven’t been to the theater here, then I strongly recommend that you do. It is really nice; movie style popcorn (I love how even here in Mexico the popcorn costs as much as the movie), candy, a coffee shop, a separate candy/nut shop, auditorium seating, nice bathrooms, and sometimes you are the only people in the theater! 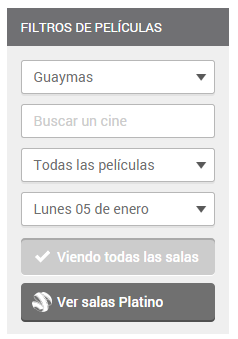 Once you go to cinemex.com website, at the very top center you will see “Selecciona tu ubicacion” in a white box, click on the arrow down in the right of this box, scroll down to Sonora and click on Guaymas. You can then click on the red box right next to this location box that reads “Ver toda la cartelera”. This will display all movies showing at the Guaymas theater. At the side of this screen, you will see a column in grey that reads “Filtros de peliculas”. The third box down reads “Todas las peliculas”. Click on the arrow down in the right of this box and it will display all the movie titles playing. Click on the movie you want to watch to see the showing times. OR you can go to the fourth box down that reads today’s date i.e., “Miercoles 07 de enero”, and click on the arrow down in the right of this box to select the date you want and all movies with their show times will display. Often, this site only allows you to see ahead about 4 days for movies and their show times. Now hit the arrow back key at the top left of your desktop screen and go back to the main page of Cinemex where you entered the location of the theater as Guaymas. Right below the banner across the top that flips showing movie titles you will see a row of four boxes. The first box reads “EN CARTELERA” which means what is Currently Showing. The next box reads “ESTRENOS DE ESTA SEMANA” which means what is coming Next Week. Once you click on this box, if you hover your mouse over a particular movie and then click on it, you will be taken to a page that gives the date when this movie is premiering here. Remember the dates listed are in Mexican format i.e., dd/mm/yyyy. You can also watch the trailer from this page by clicking on “Ver Trailer”. OK, back at the main page, the third box reads “PROXIMOS ESTRENOS” which means New Releases Coming Soon. Hover your mouse over a particular movie and the movie poster will change into two stacked circles. The top circle in pink will display the date this movie is coming to Guaymas. The fourth box on the main page reads “PREVENTAS” which means movies that are coming in the future that you can Buy Tickets For Now. 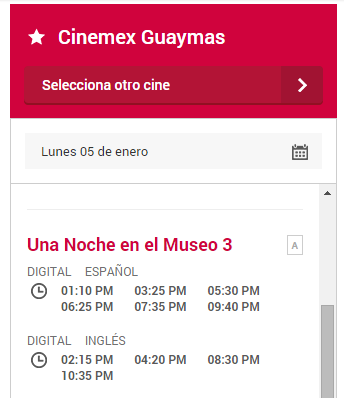 Lastly, just to confuse you (kidding), from the main page, you will see a column on the side that has a red border top with a star symbol and “Cinemex Guaymas” in it. Just below this you will see the date listed and just below this are all the movies playing on this date and their show times. You can click on the calendar symbol to the right of the listed date and select another date (again you can usually just go about 4 days into the future), to show the movies and times playing here. Digital Ingles means it is playing in English with Spanish subtitles. Digital Espanol means it is playing in Spanish. And Digital 3D means it is shown in 3D (usually this will indicate whether in Espanol or Ingles). If you are a frequent movie goer, and your schedule allows you to attend movies on Tuesdays, then it is worth your while to obtain a Cinemex card. The process to obtain a card is easy and the biggest benefit is you get movies on Tuesday at a 2×1 price (or 29 pesos per person). 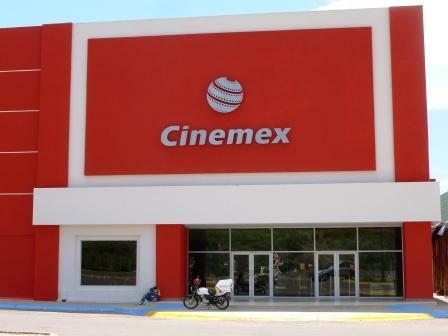 The next time you go to Cinemex, visit the Customer Service desk located to the left of the box office counter where you purchase your movie tickets and ask for a card by saying “Puedo tener una tarjeta?” (Can I have a card?). The Cinemex employee will ask you for identification. They will enter the information needed for your card from your identification. They will then ask you your “fecha de nacimiento” (birthdate) and your “correo electrónico” (email address). For the email address they will turn the keyboard over to you to type yours in. They then will hand you your card. Upon receiving your card, you will receive an email from servicio@payback.mx asking you to “registro tu tarjeta” (register your card). Either click on the link within this email or go to payback.mx. Enter your card number in the top box and hit Tab. Type in the letters exactly as you see them to the left of where your cursor is. Click the red box at the bottom. Chose a 4 digit NIP number (this is the same as a PIN number) and type it in. Click red box at the bottom. Now you will be directed back to the payback.mx website with the screen showing your name in the upper right hand corner as being signed in. Under your name may be a number and this is your current Points Balance. Every 10 points equals 1 peso and these points can be redeemed at various locations listed on this website under “Usa tus Puntos” under the menu bar at the top of the screen.